In our daily operation, we may have to reserve or hold some items in the warehouse which may arise from quality issue (product quarantine), customers have placed order or yet to be issued to production for further actions. After the items have been locked, it can’t be retrieved through OUT operation unless UNLOCK is performed. This process is handled by LOCK operation. 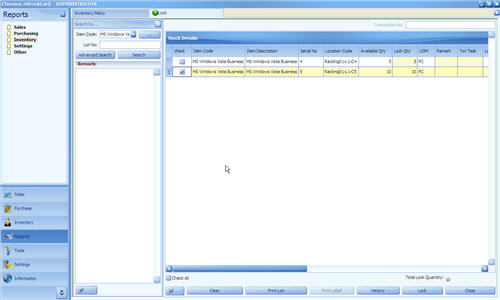 If you wish to reserve less than 10 copies, you enter your desired quantity at the Lock qty field and click “Lock”. Step 3 Click “Clear” to perform new LOCK operation. Otherwise, click “Close” to exit from LOCK operation. 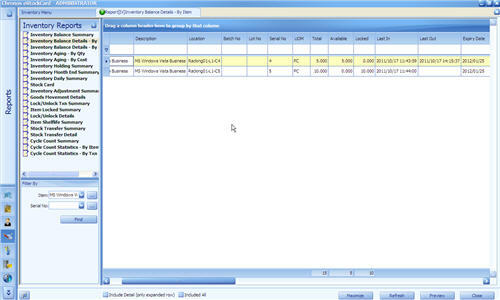 Step 1 Click “Reports > Inventory > Inventory Details – By Item”.